In December Tangerine Dreaming announced a team of the first half of the season putting forward a team of players who had played against Blackpool and observed by TD. 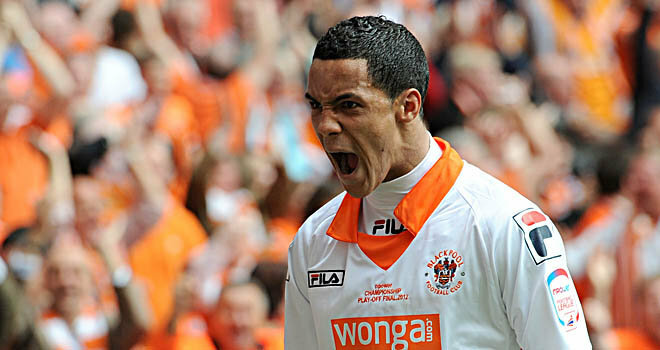 No Blackpool players were named in their in order to be shed of any potential bias. Players have been picked to fill a 4-3-3 formation for purely arbitrary reasons. Here is the Championship team for the second half of the season. Before the recent 2-0 win over Ipswich Ian Holloway stated that he had laid down a golden rule for his centre backs Ian Evatt and Craig Cathcart to follow. This post will take a speculative look at trying to establish what that rule is. Evatt knows the golden rule now! “ I’ve looked at it and come up with something I think is really relevant from a coaching point of view. “I have explained it and I think it is a golden rule both my centre-halves will have in their brains now. As Holloway came up with this rule after watching the goal that was conceded against Palace, this post will take a look back at that concession and lay down what happened, before coming up with ideas about the ‘golden rule’. Step 1 – The ball is played out to Dean Moxey on the left wing. He has Brett Ormerod (marked in red in the picture below) covering him moderately, but he has enough space to swing a foot at the ball to cross it. 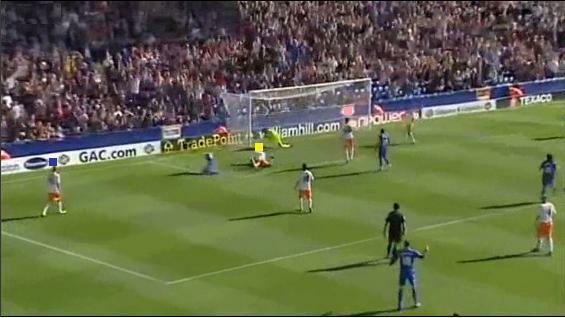 Step 2 – As the ball is played Alex Baptiste (blue) is positioned in behind Ormerod, but the ball evades him and enters the box. Ormerod highlighted as red, Baptiste in blue and Cathcart in the centre in pink. 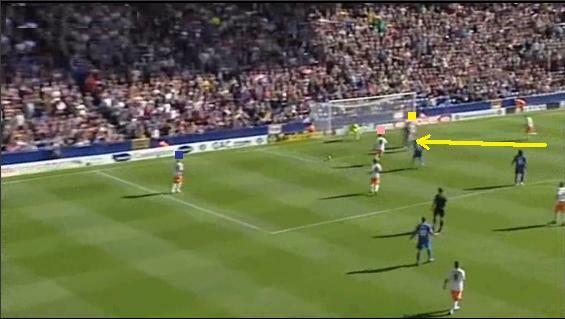 Step 3 – Ian Evatt (yellow) starts to track the run that Murray has started to make to the front post. Craig Cathcart (pink) is positioned in behind Baptiste as the ball heads towards the six yard box. Step 4 – Murray finishes neatly as Evatt lunges to make a tackle ending up in a heap near the front post. 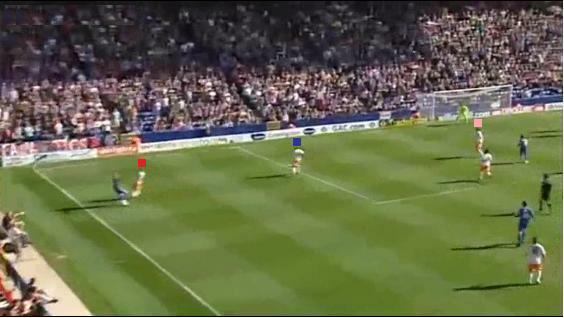 Evatt (yellow) did all he could and Cathcart (pink) watches the ball ripple the net. That was the goal that was, step by step. On the face of it a good run by Murray, but clearly a poor goal for Blackpool to concede. Why poor though? Firstly, Moxey was given too much time to cross, the ball wasn’t cut out by the first man, nor was it cut out at the second time of asking and finally an unsuccessful challenge for the ball before the goal was scored. All in all Blackpool missed four chances to stop the goal. However, what can be learnt here when searching for the golden rule? First and foremost the job that Ormerod did can be discarded as he isn’t a centre back. The same goes for Baptiste as in this game as he lined up at right back. That leaves just Cathcart and Evatt and their roles in the concession. Before the steps to the goal above, both centre backs were reasonably well positioned, Cathcart however, ends up spare as his man drops off him he stands facing the ball on the left and watches the ball being crossed, evading Baptiste and turns and virtually stands to watch the ball roll in behind him and in to the six yard box. Evatt on the other hand realises that Murray is making a run across him and follows the run remaining active all the time. It would be very easy just from this basic review to blame Cathcart for ball watching. However, Holloway is clearly stressing that this rule applies to both centre backs and they should work as a team. So what could this rule be? The rule could be many things, however, for Holloway to be so forthright it must be something he has had to think about in detail, so right away it surely cannot be, ‘don’t ball watch’. That is too simple and it is an assumed defensive duty of any player. Add to that, ‘ensure your striker doesn’t get his shot away’, or ‘stay on your feet’. It might be, ‘ensure the first man cuts out the cross ball’. However, given that Baptiste was the first man, that can’t apply here. With the aid of a diagram, let’s consider the shape of the centre backs and their movement during this goal. It is this which will hold the key for the rule. 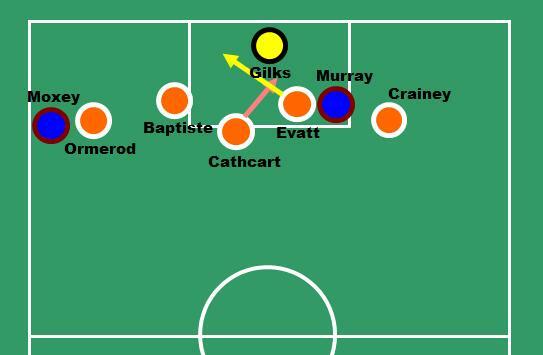 The positions of Evatt (yellow) and Cathcart (pink) and their movements. The first observation to make is that Cathcart’s position as the ball is crossed is poor. He isn’t in line with Baptiste, in fact he is in front of him. He is also in front of Evatt. This is of interest as he has effectively removed himself from being able to defend the type of cross which is played. This leads on to the first attempt at defining the golden rule. Could it be; ‘Keep your full back positioned in front or level with you at all times’? The second observation to make is the positions of both centre backs after the goal has been scored. Evatt ends up as the right-sided centre back and Cathcart to his left. Their movement crosses over each other and which might mean the golden rule is defined as; ‘Never cross over’. This is a little more complex than the first rule as it involves better communications between the centre backs to pass over the marking duties from one to another. Given this goal was so close to the goal line and at speed, it would be excessive to expect marking to be passed in that situation and entirely reasonable for Evatt to track his man. This gives us two potential ideas of what the golden rule is, with the first being the most simple and the easiest for them to follow. The second may well be possible, but further from the goal. Effectively that would be zonal marking with neither defender straying too far in to each other’s zone and therefore never-ending up crossing over. However, the first rule may be more to the point. As it is, it’s overly simplistic and needs to be developed. The key could be that in combination with keeping position in relation to the full back they should also position themselves in relation to the goal when a cross is coming from the wing. So Cathcart by the terms of the first rule should be positioned deeper, however, Holloway may want him more in line with the front post as well to defend that position better. This gives him more time to adjust to the cross and in addition to being deeper he can see the cross coming in to the box with the ball being in front of him. Also, it removes the space that the striker can attack with a run to the front post. ‘When defending a cross never be in front of your full back and if the cross comes from your side of the pitch stand in line with the front post’. This would ensure that the centre back sees the ball coming in front of him and can deal with the danger and should an opponent attack the ball, then he will be covering the goal at the front post and it would take something special to make a goal. So in all, it’s not a catchy rule, it’s certainly common sense, but it may also not even be right. Whatever the rule is, it must be about positioning as everything else seems too simple. However, sometimes the simple things are the most effective, but whatever it is Blackpool kept a clean sheet against Ipswich and if more clean sheets start to appear then the golden rule will be worth its weight in gold. If you have your theories about the golden rule then use the comments section below to share them. Blackpool start the season with a win and a clean sheet, but at times Hull were threatening and had they shown more composure in front of goal then they may have secured a draw. Hull set up in a standard 4-4-2, with Robbie Brady starting wide left supported by a central midfield duo of Paul McKenna and Tom Cairney with Robert Koren holding position on the right flank. Up front Dele Adebola and Matty Fryatt were given starts. For Blackpool Craig Cathcart lined up in the middle of defence with Alex Baptiste at right back. Barry Ferguson anchored the midfield with Keith Southern and Elliot Grandin supporting him as Ian Holloway set up in his normal 4-3-3. Up front Kevin Phillips held the central striker role supported by Gary Taylor-Fletcher on the right and Brett Ormerod on the left. Tactically the game appeared pretty straight forward. Hull looked to close Blackpool down quickly and high up the pitch. In possession they either went high and long to Adebola or worked the ball to the flanks. Blackpool on the other hand sought to control possession in midfield, but went long from back to front quite often wide right to the head of Taylor-Fletcher. Hull had the best of the early part of the match. They looked to try and make Blackpool rush their possession and in particular both McKenna and Cairney stepped up when required to pressurise Ferguson in the deep. Brady was the main threat throughout the game and Hull tried where they could to get him one v one where possible and subsequently he was able to get in to some good crossing and shooting positions. Hull looked to get Liam Rosenior forward from right full back but in truth he struggled to break in behind the Blackpool defence when he had space to exploit. As the first half progressed Blackpool controlled the centre of the pitch winning tackles and loose balls to assert their dominance. Elliot Grandin found himself in good forward positions between the Hull defence and midfield but struggled to pick the right pass. 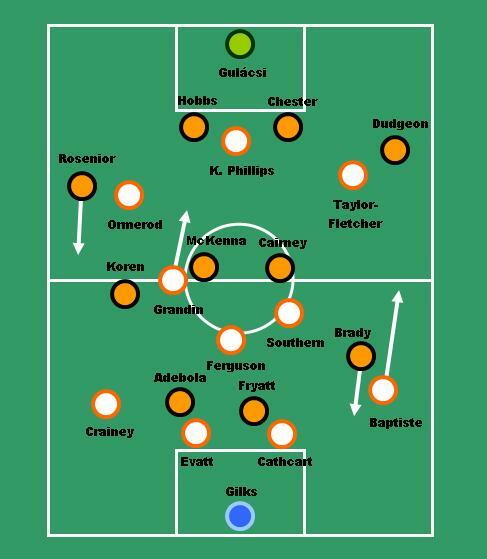 Even though Hull worked exceptionally hard in closing down Ferguson, he was well supported by Grandin and Southern as well as the defence providing him with passing options so Blackpool were rarely exposed in midfield. In forward positions Blackpool weren’t very fluid in their movement, Taylor-Fletcher often staying high and wide and not necessarily backing up Blackpool’s suggested game plan of exposing Joe Dudgeon to the high ball. As the half progressed Taylor-Fletcher went in search of the ball and Blackpool instantly looked more potent around the final third. Even though Hull had chances in the first half, Blackpool held the advantage in the critical centre of the pitch and that remained in the second half. Pearson’s main change in the second period was to swap over Koren and Brady around 58 minutes. Brady continued to look dangerous, but less could be said of Koren. 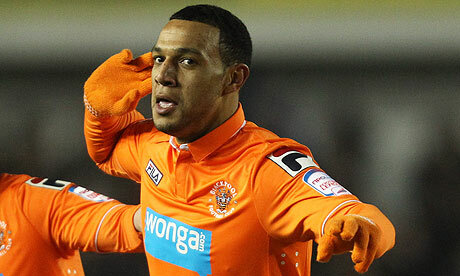 Brady caused trouble for Blackpool all game long and his two footed ability makes him hard to read. His delivery was reasonably good and varied, and will take a shot on even with the most limited opportunity. However, Hull’s strikers lost their composure when they could have scored but they were also let down through a lack of guile in their forward movement which made them predictable at times. When Brady wasn’t creating, their main chances tended to come from some poor organisational and positional play from the Blackpool back line. Even though Blackpool enjoyed a numerical advantage in the centre of the pitch they generally exerted better pressure for two reasons. The use of Baptiste and the introduction of Billy Clarke. Alex Baptiste had a strong game from full back and from the half hour mark added some excellent progressive running to support the attack and occasionally was the furthest man forward. He defended excellently, rarely being beaten and also made a last ditch tackle. He has given Holloway the ideal solution after the last minute debacle over Neal Eardley and his contractual issues and is probably first choice at right back again. Keith Southern and Barry Ferguson dominated with good passing and link up play with Grandin however only once Billy Clarke came on did Blackpool start to threaten in the final third. 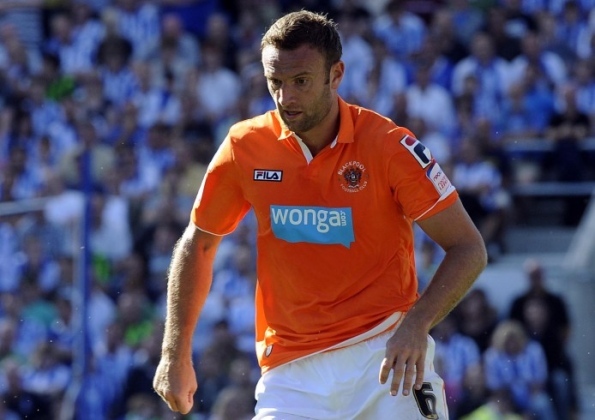 Clarke’s movement opened up the forward line and gave Blackpool’s midfielders plenty of options and their forwards better spaces to run in to and it was from his deft flick that Blackpool made their winner. Hull looked dangerous at times and when teams are matched man for man with them they’ll enjoy some great success and if they can generate composure in front of goal then they’ll have a strong season. Blackpool on the other hand will hope to move better in the final third and work their high defensive line with more anticipation and composure. Three points is a most welcome start for Blackpool, but there will be greater challenges ahead.